An annular eclipse occurs when Moon is directly between the Sun and the Earth. However, because it is too far from the Earth to completely hide the Sun, there is a ring (Latin annulus) of Sun still visible around the Moon. Use the same precautions to view an annular eclipse as you would use to view a partial eclipse. With very short annular eclipses, it’s possible to see the chromosphere and Bailey’s beads. The term annularity is an obscure usage, which describes the same period and location as totality but during an annular eclipse. There are several variations of astronomical time, but the term in general refers to measuring the length of the day (with the implied rotation of the Earth) with reference to the position of Sun or other stars. Nowadays, civil time is kept by atomic clocks and synchronized with astronomical phenomena by measuring the variation in star position at a given time from its expected position, the published and predicted values for ΔT. When an eclipse occurs near the horizon, often at the sunrise or sunset limits, atmospheric refraction can play a significant role in determining the contact times. Because the atmosphere is frequently changing, the calculated times can be in error by several seconds. Another eclipse effect caused by the irregularites in the lunar limb, Bailey’s Beads refers to sunlight shining through the Moon’s valleys as the Moon profile grazes the edge of Sun. The effect is best seen at the northern or southern limits of a central eclipse. Besselian elements are the coefficients for a set polynomials which can be used to describe the eclipse path. The elements approximate the movement of Moon’s shadow on the Earth over a short period surrounding the eclipse. A central eclipse is an eclipse where the shadow of the Moon falls directly on the Earth, or would fall on the Earth if the Moon were nearer to the Earth in its orbit. These eclipses are classified as either total, annular, or hybrid. The central line is the path projected on the Earth, of the line joining the optical centers of the Moon and the Sun. The northern and southern limits are asymmetric about the central line, varying with the geometry of the eclipse. The symmetry is best when the eclipse path is near the equatorial regions of the Earth. Surrounding the photosphere, the reddish solar chromosphere is best seen during Bailey’s Beads or a very short annular eclipse. Our clocks are set to civil time, which is related to the position of the stars and the Sun, through a quantity known as ΔT. Clock drift is the error that occurs since the last time a clock was synchronized to a known time source. Projecting great distances into space, the solar corona was, until recently, only visible during a total eclipse of the sun. The shape of the corona is highly variable and related to sunspot activity. ΔT, pronounced as “delta-tee,” synchronizes civil time with astronomcial time. Increases in ΔT will shift the eclipse path east. Technically, like the weather, ΔT can not be determined a priori, but near term estimates are much better than those published years in advance. The diamond ring effect is seen just before second contact and just after third contact. At these times the eclipse is nearly total, except for some Sun shining through deep lunar valleys. With the corona visible around the the rest of the Moon, the eclipse appears as a sparkling gem in sky. The time it takes the moon to return to the place where it crosses the ecliptic (a node) is known as a draconian month. Since eclipses can only occur near these nodes, the draconian month figures prominently in the saros cycle. The name stems from a belief in Medieval times, when the two nodes were thought to be part of a dragon that caused eclipses. The Hindu religous epic, The Mahabharata, identifies the ascending and descending lunar nodes and describes their role in lunar and solar eclipses. When sunlight falls on the Earth, it is partially reflected back into space. This earthshine faintly illuminates the near side of the Moon. It is possible to see the lunar surface in long exposure photographs of the eclipsing Moon. At the eastern (umbral) limit observers on the eclipse path see totality at sunset. West of the eastern penumbral limit, and outside the path of totality, viewers will see a partial eclipse. 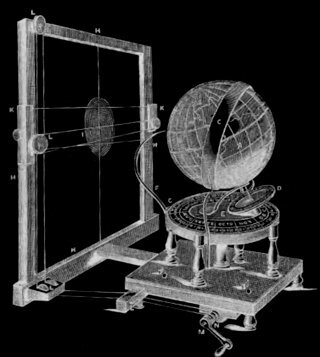 —Astronomy explained upon Sir Isaac Newton's Principles: and made easy to those who have not studied Mathematics..., James Ferguson FRS, London, 1799. Eclipse path describes the path taken by shadow of the Moon (or its projection in the case of an annular or hybrid eclipse) falling on the Earth. The central line occurs about half-way between the northern and southern limits. (Solar) filters are necessary to view the Sun any time and place outside of totality. As an alternative solar projection may be used. Use the same filters that are available for viewing the Sun when it is not eclipsed. First contact, also known as C1, is the moment the Moon begins to encroach on the solar disk. 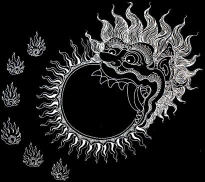 The Balinese demon Kala-Rahu chases the Sun and Moon and eats them when he catches up with them. Fourth contact is the final moment when the lunar disk may be observed taking a bite out of the Sun. C4 marks the end of the eclipse. A full moon occurs when the Moon crosses a plane perpendicular to the plane of the Earth orbit which passes through the line between the center of the Sun and the center of the Earth. In scientfic usage, a full moon only exists momentarily as it passes through the plane, an alignment known by the term, syzygy. If in addition to passing through the plane, the Moon specifically passes through the shadow of the Earth, people will see a lunar eclipse. The magnitude of gamma (γ) measures how close the eclipse occurs to the Earth’s equator. Postive gamma is north of the equator; negative: south. As the absolute value of gamma increases, so does the asymmetry of the northern and southern limits about the central line. General (eclipse) circumstances are computations which include the eastern and western limits of the eclipse, the point of greatest eclipse. The umbral and penumbral intercepts with the Earth are part of the sunrise and sunset limits. The point of greatest eclipse describes the place on the Earth’s surface where the observer may view the maximal obscuration for a partial eclipse. For a central eclipse it is a point on the center line near the location where the observer may see the eclipse of greatest duration. “Hybrid eclipse” describes an eclipse where the Moon’s distance from the Earth changes during the eclipse so that it is visible in some locations as an annular eclipse and at others as a total eclipse. The International Earth Rotation Service (IERS) keeps track of how the Earth’s rotation relative to the stars differs from the time kept by atomic clocks, and publishes this value (ΔT) and daily predictions for changes to ΔT up to one year in advance. Eclipsareon computes local (eclipse) circumstances. These include the times of first through fourth contact at a given location using Besselian elements published by NASA. Irregularites in the lunar limb can result in several seconds of variation to the times of second and third contact unless they are taken into account. When the eclipse appears near the horizon, atmospheric refraction also plays a role. When one speaks of “local noon” it is a reference to the position of the Sun in the sky. The Sun is on the local meridian. Half the daylight will occur before local noon and half, after. The Sun is at its zenith. The Kaguya ( かぐや ) satellite was a Japanese project which mapped the surface of the Moon, notably defining the lunar limb with much greater accuracy than before. 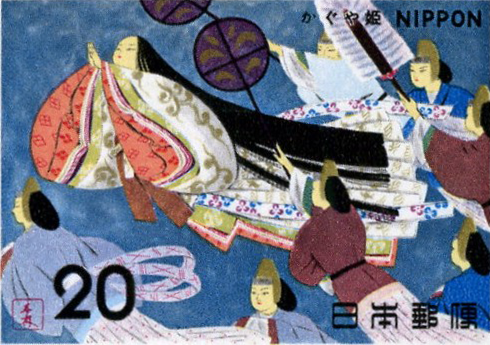 The story of Kaguya, The Moon Princess, is told in perhaps the oldest Japanese folktale, The Tale of the Bamboo Cutter. A lunar eclipse occurs when then Earth comes directly between the Sun and the Moon. During a lunar eclipse, the full moon will appear reddish to those observers who are experiencing night on Earth. Lunar eclipses are classified into partial or total eclipses, depending on whether the Moon is only partly or totally in the Earth’s shadow. Because the Earth is so much larger than the Moon, it takes a few hours before a lunar eclipse is completed. The slight rotation of the Moon, both east-west (Δl) and north-south (Δb), is known as the (physical) lunar libration. Because the Moon is so close to the Earth, values calculated for an observer at the center of the Earth (geocentric libration) must be adjusted for an observer on the Earth’s surface (topocentric libration), and also for the location of the observer on Earth (optical libration). The profile of the Moon against the sky is known as the lunar limb. Because the Moon has peaks and craters, the edge-on view is irregular. Also, a slight rotation of the Moon, known as the lunar libration changes the profile. The original limb profiles for the Moon were done by observing occultations of stars and planets from Earth. These timing were transcribed into the Watt’s charts in the 1950s. Recently, the Kaguya lunar satellite measured the lunar surface using imaging radar, and these form the basis of the profiles used by Eclipsareon. A lunation is the (variable time) period required for the Moon to return to the new moon phase. This is also known as a synodic month. Brown’s lunation number, is a count of the number of times the new moon has occured since the first new moon of 1923. A magnetometer is an instrument that measures the compass direction to the pole. The local meridian is an imaginary line through which Sun passes when it is at its highest point in the sky. This occurs at local noon, and hence we have the time of day measured before local noon denoted as ante meridian (AM), or after noon known as post meridian (PM). The United States’ National Aeronautic and Space Administion, NASA, has long published eclipse viewing information for public and scientific use. Network Time Protocol, NTP, is an internet standard for propogating the correct time, and estimating errors in that propogation. Eclipsareon uses NTP to estimate the error in the clock on your device, however, it is unable to adjust the system clock for this error. A new moon occurs when the Moon is aligned in a plane directly between the Earth and Sun, perpendicular to the Earth orbit. The far side of the Moon is illuminated by the Sun, so the Moon is not visible on Earth. If the Moon’s shadow falls on the Earth, people on Earth see a solar eclipse. The near side of the Moon during a new moon is illuminated by earthshine. “Northern (umbral) limit” describes the northern edge of where the Moon’s shadow will fall on the Earth during the eclipse. Between the northern and southern limits lies the central line. The term (maximal) obscuration refers to the greatest area of the Sun covered by the Moon when the observer is outside the eclipse path. Occultations occur when one object appears to hide another. Besides the local meridian, objects in the sky traverse many imaginary lines of parallax as they proceed from East to West. The parallactic angle describes the apparent rotation of the object around its center as it crosses the sky. A partial (solar) eclipse occurs when the Moon partly covers the Sun. Although there is no greater danger than at non-eclipse times, you must observe through solar filters, or using solar projection to view the eclipse. Animals are often very sensitive to the variation in light. Watch them for behavioral changes. The partial phase occurs before second contact or after third contact the Moon only partially obscures the Sun. This is always true for viewers outside the path of totality. The penumbra is the diminished sunlight seen during a partial eclipse. The disk of the Sun is known as the photosphere, from which sunlight streams. It occupies about ½° of the sky. One of the best ways to view the Sun is by (solar) projection. By piercing a sheet of paper or thin cardboard with a pin, it is possible to safely view the projection of the Sun’s image through the pinhole falling on another surface. (Do not view through the pinhole directly!) This effect occurs naturally and artistically when viewing the projection of the Sun through dense leaf cover, as it falls on the ground during the eclipse. An unusual form of eclipse can occur at the polar regions. Known as a retrograde eclipse, the Moon’s shadow falls first on the eastern limit and proceeds west. The geometry of the eclipse is such that the shadow falls beyond the polar axis, on the far side of the Earth. The saros cycle defines a family of related eclipses, which occur 18 years, 11 days, and 8 hours apart. This magic number is equal to 242 draconian months, 223 synodic months, and 239 anomolistic months. The 8 hour rotation of the Earth means that every third solar eclipse in the cycle (54 years, 1 month — a period known as the exigimos) is visible in the same general part of the world. 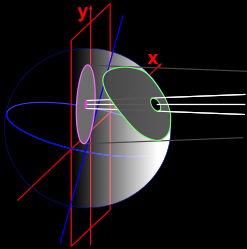 However, the eclipses in a saros proceed from one pole to the other, so that the eclipse paths over one exigimos cover different latitudes. When no sunlight is visible through the lunar valleys, C2 or second contact is said to have occured. The diamond ring may be observed just before second contact. C2 does not occur unless the observer is positioned in the eclipse path. Shadow bands are similar in appearance to the shadows that appear in deep, clear water illuminated by the Sun. The shadows typically move in one direction before second contact and reverse direction after third contact. They don’t always occur during an eclipse, but you may spot them more easily on a flat white surface. The Solar and Heliospheric Observatory, SOHO, provides realtime views of the solar corona. A solar eclipse occurs when then Moon comes directly between the Sun and the Earth. Because the lunar orbit is irregular, the Moon’s shadow usually falls either above or below the Earth during a new moon. Since the Moon circles the Earth on regular basis, and the Earth likewise circles the Sun, it is possible for a similar alignment of Sun, Earth, and Moon to appear at regular intervals related to the periods of the lunar and Earth orbits. This interval is known as a saros. The southern (umbral) limit is the southern edge of where the Moon’s shadow will fall on the Earth during a central eclipse. See also, northern limit and central line. Except for a retrograde eclipse, the western most viewers of an eclipse are those who are at the sunrise limit. Because the Earth is rotating on its axis during the eclipse, some viewers will experience the eclipse coming into view as the Sun rises. The western edge of the sunrise curve denotes locations where the eclipse ends at sunrise, and at the eastern edge of the sunrise limit curve viewers will see the eclipse begin at sunrise. Similar to the sunrise limit, those viewers at the sunset limit will experience the eclipse disappearing from their view as the Sun sets. These are the last viewers on Earth to witness a particular eclipse. Observers report that seeing the umbral cone lift into space is an amazing sight. Dark areas on the Sun’s photosphere are known as sunspots. Their number is variable over an 11-year sunspot cycle, and over the longer term, for still unknown reasons. The orbital movement of the Moon around the Earth every month gives rise to a number of varying definitions of a month, depending on whether one is considering the illumination of the lunar surface (a synodic month), or simply the position of the Moon in its own orbit (the anomalistic — from perigee to perigee — and draconian months). If one further considers the motion of the Earth around the Sun, one has either a tropical month, or by measuring the position of the moon relative to the stars, a sidereal month. Third contact occurs just before the trailing edge of the Moon allows the Sun’s photosphere to reappear through the lunar valleys. As with second contact, the observer must be in the path of totality for C3 to occur. With the advent of rail travel, timezones were introduced so that travelers no longer had to adjust their watches from city to city. A total (solar) eclipse occurs when the Moon completely covers the Sun. Only in the eclipse path will observers see totality. Others will observe a partial eclipse. Totality is experienced in the eclipse path between second and third contact. Just before and after totality, look for shadow bands, and pay attention to the temperature and wind. Also you may briefly see a diamond ring, and especially near the northern and southern limits you should look for Bailey’s beads. During totality, observe the solar corona and look for nearby bright stars. The lunar umbra, a Latin word meaning shadow, falls on the eclipse path during a total eclipse of the Sun. The special timezone, UTC, represents the time at 0° longitude, unperturbed by other considerations, including shifts to observe daylight savings time. At the western (umbral) limit observers on the eclipse path see totality at sunrise. Viewers west of the western penumbral limit (known as the sunrise limit) do not see the eclipsed Sun.